What an exciting week it’s been! You know those days or moments when you see a lot of groundwork (hard work) start to pay off; like when you see the first tomato appear on the vine or the first sprig of a pepper plant pop up through the dirt? Well, we had one of those this week. For the past several years, we’ve been talking about and planning and laying the foundation to provide library services around the needs that our patrons have when it comes to working with data. Years, I tell you. When my colleague, Rebecca, arrived last August to take the reins in this effort, I’d been out pounding the pavement for a good while, building relationships and doing individual data-related projects, and perhaps most importantly, getting a sense of who did what and when and where and how. Rebecca got to work strategizing, writing plans, working with our library’s administration and other higher-ups in the university, while Lisa and I provided experience and the connections needed to pull it all together. We developed a Library Data Services Advisory Group, bringing a few vested parties to the table. We did an extensive environmental scan to find out what the different stakeholders on campus thought the Library’s role might be in this area. We talked to lots of people. We surveyed students. We gained a lot of insight. Meanwhile, I continued to do my work with the mammography study team, part of which involved helping put together a mini-symposium around data issues in clinical research. We brought together clinicians, members of our Quantitative Health Sciences (QHS) Department, and members of University’s Information Technology Department. We also surveyed colleagues to gauge their interest and needs in this area. Sitting in these different groups, working on these different teams, I started to see pretty clearly that multiple things were happening on campus; that there was at last some real thought and energy being put towards addressing some of the needs we have around data. I also started to see that a lot of right hands weren’t aware of what their left hands were doing. And the most exciting part of that (when I got past being frustrated) was this… I knew what both hands were doing! A few weeks back, I wrote about that frustrating part, as well as how I see how exciting it can be when we (librarians and thus, the library) are positioned in a way to make things happen. And this past Monday, was one of those exciting moments. We ALL came together; representatives of each of these groups that I’ve been witnessing talk about what to do to address the data needs at UMMS. The librarians, the clinical researchers, the computing services folks, the QHS people… we were all at the same table where we could share with one another what we do, what we know, and how we can help. And we came away with some very real, tangible projects that we can tackle together. It really was one of those times when I felt a sense of accomplishment in this task that’s been nebulous, to say the least. And… I was also hired by the University of Rhode Island’s Library & Information Studies program to teach the course on Health Sciences Librarianship this fall. (I’m really excited about it!!) Totally unrelated to the previous tale, but the two events made for a pretty great week. I hope you’ve had the same! Maybe I should offer a little background, first. Aim 2: Assist investigators in identifying and reporting information technology issues that have arisen in the implementation of the study that may be of use to others. After spending a great deal of time searching the literature in fields from information technology to medical informatics to team science (or simply teamwork), I realized that not much existed that fit the issues that they’d encountered. Further, I wasn’t convinced that writing an article and/or white paper on the topic was the place to start in terms of reporting their experience. I thought that perhaps bringing people together, i.e. the different stakeholders, to talk about the issues, problems, lessons learned, etc. that occur when IT folks and a research team come together to work on a project. I felt that such a discussion would yield a lot of valuable information that could then, somehow, be collected, organized, and disseminated in a useful manner. After a lot of talk and brainstorming within the team, we all agreed that this seemed a good path to take. Making a long story short, this idea took hold, evolved, grew, and a couple of weeks ago, took the form of a mini-symposium that was part of the annual research retreat for our Center for Clinical and Translational Science. The program, entitled, “Data Acquisition, Data Management, and Subject Tracking in Clinical and Translational Research: Seeking Solutions to Persistent Challenges,” brought together the researchers from the mammography study, two faculty members from our Department of Quantitative Health Sciences, a biostatistician from the University of Massachusetts, Lowell, and a representative from our Information Services department. My role now is to pull all of the content from the symposium, along with other useful resources, and make it available online for the benefit of our research community. This is all a really happy story for me in that I’ve been able to help facilitate and see something come together that we have been talking about in my library for a number of years now. Finally… FINALLY … people are starting to talk about issues around data. For too long, the only folks that I’ve heard talking about managing data are librarians. And frustratingly, we’ve mostly been talking among ourselves. But over the past months, I’ve been able to watch people that we’ve been wanting to reach addressing the issue. And best of all, the different players are talking to one another and not just among themselves. So why the frustrating digression in my notes from Tuesday? Well, it’s because in my position, I can see several things happening. First, I can see several different camps, including the library, trying to stake their claim on one or another aspect in the data management services suite. And there’s a lot of overlap. 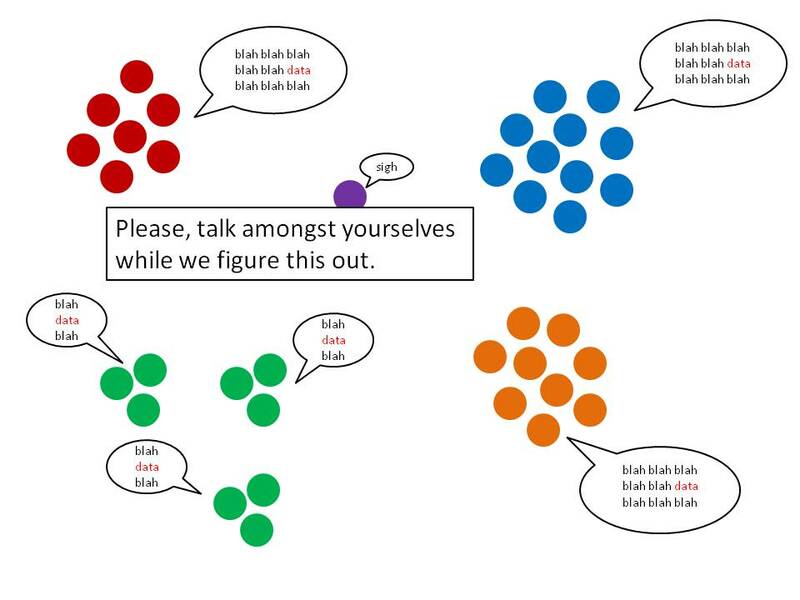 Lastly, despite the success of the mini-symposium, there’s still an awful lot of “talking amongst ourselves” going on. I see this more easily, and thus get a little frustrated at times, because I have my foot in several different areas where I’m hearing the same message. In other words, despite the success of bringing people together for the mini-symposium, there’s still a lot of room for improving how well we communicate and coordinate our efforts, not only campus-wide, but even within my library. So when I wrote “LET’S DECIDE!” it was my reaction to what I see as a really big need that we can fill. There is a huge need for someone to fix the broken communication system, help eliminate some of the duplication of efforts, and facilitate the development of services around data within my institution. And I believe that someone is me and my colleagues in the library. One of the characteristics of the library that was lost when we brought our resources to the researchers was our place as the hub of a lot of academic activity. People used to come to our physical library and here the different worlds of campus would collide. Researchers and faculty members and clinicians were forcibly less isolated in labs or offices. They literally ran into one another and likely had a bigger picture of things that were going on, simply through the interactions. At the same time, librarians were more easily able to know a lot of what was going on, too. We had a front row seat for all of the collisions. What I’ve found, as I got out of the library and started working on research teams, is that by going to the people that used to come to us, I’m bringing that lost quality back to life. While it can be incredibly frustrating to observe different groups addressing the same issues, each unaware of what the other is up to, the fact is that I can make them aware. The mammography study team didn’t know that a team in the library has been working and working and working towards a goal of teaching good data management practices to the students, but as I’m a member of both teams, I did. So, when the study team made a suggestion that we recreate the symposium via a webinar series, archive it, and make it available to the students as part of their curriculum, I immediately chimed in, “Wait! Let me tell you what we’ve been working on.” A similar thing happened with the data management group in Quantitative Health Sciences. And now, we have a meeting scheduled for next month where we will bring these groups together – the research team, the QHS group, IS, and the library’s data services group. To me, being able to facilitate these gatherings is one of the most rewarding parts of this informationist work. It’s a great role for librarians to take in the area of data management. As I wrote a few posts back, it’s the networking aspect of eScience and a place where we can put our skills to good use. The library itself used to bring people together. Today, librarians do. Sweet, old Zeb loved to listen to the band. This was a pretty rotten week. It started off fantastically as I met a bunch of my favorite colleagues for fun and games (aka brunch) in Boston, saw Alison Krauss give a freebie concert at Copley Square, and dusted off my old seminary skills to deliver a summer sermon at my church. And that was all on Sunday. But driving home from the big city, I began to have the worst toothache. I stopped at the rest area on the Mass Pike to take some extra-strength something or other, and by Monday, the throbbing reached that horrible place that it seems only toothaches and earaches can ever reach. Tuesday morning found me in my dentist’s chair for 3 hours undergoing an emergency root canal. The rest of the day and the better part of Wednesday was spent lying on the couch, praying that the penicillin would start working soon. It did. Thankfully. Just in time to receive a phone call from my dad’s wife telling me that my dad was back in the hospital. He lives in San Antonio, Texas. I live in Massachusetts. As you might imagine, this doesn’t make for smooth and/or easy communication about all that’s going on for him. And then my mother-in-law decided that it’s time for her to move to another state. This month. That took my spouse away for a couple of days this week and likely more in the weeks ahead. By the time I went to the hospital cafeteria yesterday morning, simply looking for some nice, soft, scrambled eggs to eat, only to find that they’d pulled all of the breakfast foods and were setting up lunch (and it wasn’t even 10:30 in the morning)… well, I admit that I almost cried right there in the hallway. It seemed like just one too many things for the week’s pile-on. And today marks the one-year anniversary of saying goodbye to our sweet, old dog, Zebediah. He was special in so many ways. We miss him a lot, still. Rebecca comes to us from the University of Massachusetts Amherst where she was the Digital Strategies Coordinator for the W.E.B. DuBois Library. I’ve been lucky to call Rebecca a colleague for the past few years and feel even luckier now to have her as a co-worker. I once wrote a letter of recommendation for her and in it I summed up my feelings for her work abilities by saying, “If I was ever in a position to build a library staff, Rebecca would be the very first person that I would hire.” As you might imagine, I was pretty happy when she first talked to me about the possibility of applying for the position, and even more delighted when she applied and the search committee decided to hire her (let it be known that I was not part of that committee). Of course, when someone is hired to take your former position – the one that you’ve been managing, along with your new role, for months on end – you naturally assume that it means at least part of your current workload will finally ease. Something in the back of my mind knew that this wasn’t likely the case with Rebecca’s hire, though. I’ve worked for my library director too long to know that while the job title remains the same, the person filling that role brings with him/her a set of skills that may well be utilized in a completely different way. Rebecca has a skill set much different from mine (hence the reason I’d hire her to be on my Fantasy Library Team) and thus the things that I did well when I was the Head of Research and Scholarly Communications aren’t necessarily the things she’ll do well. Similarly, the department is at a very different place today than it was when I assumed that role. At that time, it was a brand new role and the kind of services that we needed to develop were based a lot upon establishing relationships, making contacts, and raising awareness of the things that the Library could provide while utilizing our current resources (like our institutional repository, my expertise in the issues surrounding the NIH Public Access Mandate, our push towards open access, etc.). Today, the Library has very solid relationships with many research departments on campus, the kind of relationships that have allowed me to move into the informationist and embedded librarian role that I’m so enjoying. We still have work to do in the promotion of our now-traditional services to this population, but it’s also time to begin boosting up the new areas and roles that we’ve hoped to do for awhile, namely, data services. Enter Rebecca and her strengths in strategic planning, the issues around data, and the library/librarian roles here, and we have a terrific opportunity for expansion. But yes… expansion means just that, i.e. more work to do, not less. I pretty much have to accept that I’m not passing off my old job to someone else. That’s not how things work today in anyone’s work world. And complaining about it is nothing much more than a big waste of time and energy. Instead, what we need to do is find the ways to share roles, morph needs, kill two birds with one stone, so to speak (I love birds and would never do such a thing). That’s the challenge ahead. In his book, Zig Zag: The Surprising Path to Greater Creativity, Keith Sawyer calls this part of “‘problem finding’, creative style.” (p. 25) He says that too often we get stuck asking the wrong questions and that the very first skill to master in developing greater, everyday creativity is to practice finding the right questions. In terms of juggling and managing my workload, both old and new things, the question of “How can I do all of this?” is likely not the right question. Maybe there’s a better solution in asking, “Do I have skills that I’m not taking advantage of?” or “Can I combine x with y when I’m teaching different topics?” or “Can I reach a larger group of people at one time?” or “Can these tasks be broken up into more manageable (i.e. share-able) pieces?” or likely dozens more. I don’t know, but I do know that there is plenty of work to be done and a seemingly limitless list of opportunities that we could take on. * And personally, I find this a much more advantageous position to be in than the one where you have not enough to do and can easily be dismissed. I also read an interesting editorial last night written by Janice LaChance, the CEO of the Special Libraries Association, in the latest issue of their magazine, Information Outlook. Entitled, “The Promise of Skills and Expertise,” LaChance notes that when it comes to the roles that librarians and information professionals assume, there is much to be said for distinguishing between one’s education and one’s expertise, as well as one’s job title and job role. I’m seeing this first-hand in my current work. Rebecca was hired to fill the same job title that I held, but the role is quite different. Similarly, my title of informationist or an embedded librarian or a research librarian really is not much more than something to put on my business card or a way to introduce myself to a group. What matters more is what I bring to the role and how well that I can explain this to the people that I wish to form partnerships with. Case in point, last week I went to a department to teach about issues related to the NIH’s Public Access Mandate. One of the PIs of the group walked in with a printout of the latest RFP from the National Library of Medicine for the next round of informationist grants. “I’ve seen this word, informationist, twice in one week now,” he said to me, indicating that he’d come across both that RFP and my signature line in an email within a few days. “What exactly do you do as an informationist?” he asked, and following the class, we had an introductory discussion about what I’ve been doing the past months in my new role, as well as some ideas he has about how he could use a similar person. Is it a collaboration in the making? I sure hope so, because it’s an awfully interesting project. But more importantly for this post, it’s a great example of how the opportunities to do new things and take on new tasks come to us all of the time. They are rarely limited to any particular job title or job description. And the expansion isn’t going to stop anytime soon. I’m really happy to have a new co-worker on this adventure and look forward to the questions we’ll come up with together. The everyday work-a-day will continue to be full and yes, sometimes a little frustrating in that I can’t get everything done that I’d like to do, but in all honesty, the diversity of the role is why I became a librarian in the first place. Who wants to do the same old thing over and over and over again? *In that same issue of Information Outlook, there is a thought-provoking (and inspiring, to me) article by Colleen Shannon, manager of technical intelligence at the Hershey Company in Hershey, PA, called “Stop Trying to Serve Everyone.” The story she tells of how she led her group to match its goals with specific corporate initiatives, thus becoming its own functional group as opposed to a support unit is pretty interesting stuff, and a pretty big shift in some of the basic principles of how libraries operate. It also happens to be a thinking that I fully support when it comes to providing embedded librarian and/or informationist services. In other words, I’m perfectly content providing in-depth expertise to a few, rather than a minimal level of service to many. But yes, such work has limitations, I agree. Funny Aside: I was reading some articles on Monday and, while doing so, jotted down the phrase “comparing apples to oranges” in the small notebook that I carry around for just such note-jotting. It was a seed for this week’s post that I wrote there to hopefully germinate into a full-fledged thought. 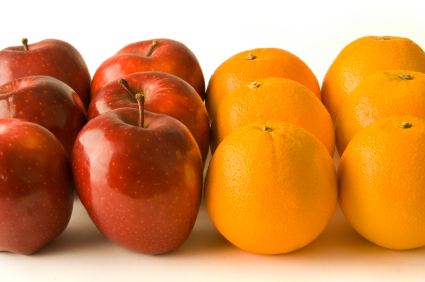 Thus, I found it quite funny yesterday when one of the co-PIs of the project I’m working on said, in a completely different context, “This isn’t comparing apples to oranges. It’s comparing apples to … humus!” Though totally unrelated to anything I’d thought of writing about, I figured it a good sign that I was on to a good title. I’m going with it. I bought two books on metadata yesterday. Personal books for my personal collection. I’ve borrowed several books on the subject over the past few months as I’ve tried to get a better understanding on the subject of metadata – what it is, how it works, and why it’s important in information systems. I know the answers to these questions in theory, of course, but I lack the nitty gritty. I needed to buy some books so that I could write in them, like most of my old textbooks of the past. Fulfillment of the tasks that I’m given as an informationist isn’t going to happen in theory. This is where the rubber hits the road, so to speak. I need to know how to analyze metadata requirements, select and/or develop necessary schema, create a controlled vocabulary, and ensure that what I come up with, propose, and implement works – more importantly, makes a difference. If it doesn’t do the latter, it’s a pretty hard sell to any researcher, let alone our profession overall, that my being on the team is worthwhile. Leverage the skills of an embedded informationist to allow the research team to more effectively and efficiently communicate about the data derived from multiple sources. By applying indexing and metadata expertise, the informationist will develop and implement tools that allow the producers of project data analyses (data analyst and statistician) to understand exactly what the consumers of the analyses (PIs, project director, operation managers) are asking for when they request analyses and to create and format analyses that effectively respond to the requests. I guess at this point it is only appropriate for me to make a confession: I have never created a metadata schema in my life (though I do think I could right a song about it, considering how those words go together so well; metadatA, schemA). I’ve never created a controlled vocabulary. I have indexed things. I have abstracted things. I’ve created tools to improve the organization and sharing of information. But to claim that I have metadata expertise is a bit of a stretch. I have a thorough understanding of some related areas, but I am far from an expert when it comes to creating and/or managing metadata. So, did we pull the wool over the researchers’ eyes when we signed off on this aim for the grant? Did we claim something that we thought they wanted to hear to convince them of my place on the team? No, I don’t think so. I think that it’s more appropriate to say that we – as a profession and in this particular incident – co-opted a trendy term, “metadata”, (it sounds so techy-important, after all) and inserted it into our own professional vocabulary to give us a toe-hold into an area where we eventually want to be. Librarians doing literature searching, teaching information literacy, and/or providing citation management are not new services. We’ve been doing these all along, outside of the venue of any research team. We have to bring something new into the team, a skill(s) that demonstrates our presence on the team, as an active and engaged member, is significant and important and vital. This will insure our place there in the future. So we pick a word that no one is really all that clear about and say we’re experts with it. The fact that no one is really all that clear about it in the first place allows us to do this. This book is aimed at two principal audiences: the information professionals who want to develop their knowledge and skills in order to manage metadata effectively, and managers who are faced with strategic decisions about adoption of IT applications that use metadata. The intention of this book is to help specialists and professionals who manage information resources to become easily conversant with this important and rapidly developing area … including … library and information professionals who want to educate themselves about a core area of skills as part of their continuing professional development. The research project I’m working on involved the creation and implementation of a tracking system for collecting a great deal of data that is essential to determining the outcomes of the study. This process took place long before I became a part of the team, but what I’ve learned from questions and observation is that this part of the project took much more time, energy and effort than anyone originally anticipated. Conversations between the research team and the IT people building the system didn’t always go well, not because people didn’t get along or didn’t want to work together, but because they spoke different languages. ENTER THE INFORMATIONIST! If I can become “easily conversant” in this area, if I can take on the role of interpreter between these two groups, then I will have a truly valuable and unique place on the team. So it behooves me to read and learn and absorb and practice – to become proficient in creating and managing metadata (and other aspects of information systems), because this is the area with the “vacant” sign hanging over it. Further, others on the researcher team are not looking for new roles. Neither are people in IT. Librarians are the ones seeking to redefine themselves. We are the profession looking for new ways to do (sometimes) old and (sometimes) new things. We are the profession not doing things we once did, thus we are the profession with the opportunity to explore some new and different things. The others in this mix are not in the same place we are. In other words, they don’t have this great opportunity that we have right now. However, there is a real need for our profession to step up and do this now. There is a good reason to say that we are experts in metadata, even if we aren’t, and it goes back to something I typed earlier, “The fact that no one is really all that clear about it in the first place allows us to do this.” No one yet knows who or what an informationist really is. No one is all that sure what a data specialist or a data librarian does. As we’re not sure what the role is, we’re not sure the qualifications we’re looking for when we’re seeking to fill such a position. This became really clear to me earlier in the week when I saw a couple of advertisements for job openings in this area. See for yourself. Do a quick search of job descriptions and job postings for this field. You’ll quickly find that there exists no one (or two or three or six) name for the job. There is no one entity where these job openings arise (some come from libraries, some from research centers, some from the private sector). And most notably to me, there is no one set of qualifications – not even one degree – that is required to fill the positions. Postings require everything from a BS to a PhD. It is this last part that really got me to thinking about – made me really aware of – how wide-open this entire field is. A recent posting for a Data Management Specialist by Johns Hopkins University states that the qualified candidate will have a Masters of Science in Engineering or Library Science. It wasn’t the first time that I’ve seen this particular coupling, but for some reason this time it struck me and I thought… My brother has a graduate degree in engineering. I have one in library science. What in the world did we ever learn in our schooling that’s similar?! What skills do we mutually possess? Answer: Zippo! Though to be fair, my brother’s degree is in civil engineering, not computer science, the type of engineering degree I presume JHU means. But this thought led me to spend a bit of time looking at the requirements of these degree programs. I chose a school that offers both degrees – my own alma mater, Syracuse University. SU is a national leader among information schools and they’ve also recently initiated a certificate of advanced studies program in data science, likely the closest we come in librarianship to computer science. I determined, in my non-scientific way, that it was a suitable choice. In addition to this, students can choose from a variety of electives, focusing their work in the areas of Information Services and Resources, Information Organization, Retrieval, and Access, or Information Systems Design and Management. After this, students complete coursework in abstract mathematics, computer organization and programming systems, data structures, programming languages, and software specification, design, and implementation. In my humble opinion, these two programs are apples and oranges, and the candidates coming out of them are apples and … humus. Or perhaps brothers and sisters. HOWEVER, please don’t read this as me bemoaning our degree or saying we are much less prepared to work in a computer-heavy, technology-driven world than our engineering counterparts. That’s not what I see when I see a university like Johns Hopkins post a job opening that will accept applications from candidates with such disparate educational backgrounds. To the contrary, I see it is a sign that when it comes to this area of data management and data services that even a university like Johns Hopkins, a world-renowned research institution, doesn’t know what or who the heck it’s looking for to fill the role. And so I’ll exclaim again, ENTER THE INFORMATIONIST! It’s “make it up as you go along” mode; “learn as you go” mode; it is, to borrow again from Johns Hopkins, “entrepreneurial library programs” mode.